I just replaced the bushings in my shifter because I was getting some weird shifts into 1st and second and reverse. I took it all apart, replaced the bushings, and added MOS2 grease. That made it feel so smooth it was like it was floating on air. The shifter was also very springy and returned to the center from both right and left with a sharp "boing." However, after I put the cables back in and reinstalled the box into the car, the shifter is slightly slow to come back from the right, and barely comes back from the left at all by itself. It still shifts fine, I just have to maneuver the shifter without assistance of a spring. I know I assembled the shifter correctly because upon discovering this I took it back out, disassembled it, cleaned it, reassembled it, greased it, tested the movement, reinstalled it, and tested it again only to find the same results. So, bad cables? Bad shift tower? there is an exact adjustment procedure to make it perfect. but on a vr, there are 2 basic movement adjustments at the trans cable ends.I dont have a pic but the one to the left(IIRC) when looking into the bay adjusts the L to R position. A little will do a lot. loosen nut, push left, push right, center, have friend lock in place/tighten. make adjustments. 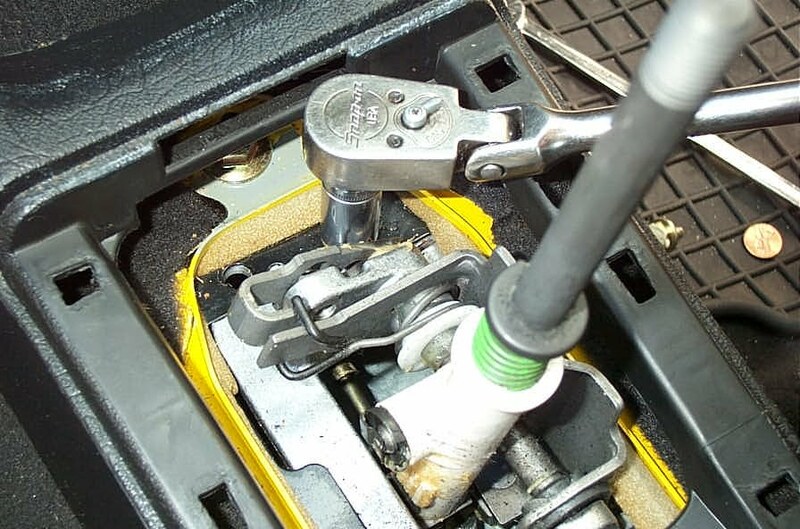 I was under the impression that those adjustments had to do with alignment of the shifter to the tower (getting gears engaged, not the rebound of the side to side movement of the shift knob inside of the car). It engages gears just fine. The original Dub and Dubber. Manche VWs sind einfach schneller als andere. I had the same problems every time I've disassembled the shifter. There is adjustment like CorradoMagic mentioned. If its not correct it won't move correctly. The bolt by the centering spring and how that metal piece is lined up is critical. Are we talking about the bolt being tightened in the picture above? The one that holds the assembly into the casing? Or, are we talking about the one that goes up and down, threads from the front of the car, and holds that lever in place? It's just below, and a little left of the head of the ratchet on the picture. You can't actually see it from that angle. Mine had marks from where it was before so I lined it up on those. Last edited by NoCYet; 02-28-2011 at 05:36 PM. I will try that. I noticed the cable wobbling more than I thought it should, so that should tighten it up I hope.